Zach Miller is a professional American football tight end for the Oakland Raiders of the National Football League. 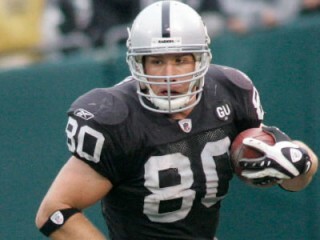 He was drafted in the 2nd round (38th overall) of the 2007 NFL Draft by the Raiders. He played college football at Arizona State. Productive pass receiver emerged as one of the NFL’s top tight ends in his second pro season…Has played in 32 games with 31 starts in two years…Career totals include 100 receptions for 1,222 yards (12.2 avg.) and four touchdowns. 2008: Became first tight end since Todd Christensen in 1986 to lead the team in receptions…His 56 receptions ranked eighth among NFL tight ends and 778 receiving yards was sixth…Averaged 13.9 yards per reception, the most among NFL tight ends with at least 50 catches…Scored one touchdown…Appeared in all 16 games, making 15 starts…(9/8) vs. DEN: Had a team-high four catches for 34 yards, including a 21-yard reception…(9/14) @ KC: Caught two passes for 24 yards…(9/21) @ BUF: Started at TE…(9/28) vs. SD: Led team with 95 yards receiving on five catches…Had a career-long 63-yard touchdown reception on a pass from QB JaMarcus Russell…(10/12) @ NO: Tied for team lead with four catches for 46 yards…(10/19) vs. NYJ: Recorded four catches for 57 yards…Had a 27-yard reception in overtime to set up the game-winning field goal by K Sebastian Janikowski…(10/26) @ BAL: Caught two passes for 56 yards…(11/2) vs. ATL: Had two receptions for nine yards…(11/9) vs. CAR: Made three catches for 42 yards…(11/16) @ MIA: Hauled in four receptions for 67 yards…Averaged 16.8 yards per catch…(11/23) @ DEN: Had three catches for 41 yards, including a second quarter reception that went for a 30-yard gain…(11/30) vs. KC: Led team with five catches for 79 yards…(12/4) @ SD: Tied a career-high with eight catches for 64 yards…(12/14) vs. NE: Led team with five receptions for 60 yards…(12/21) vs. HOU: Caught four passes for 70 yards…(12/28) @ TB: Had two receptions for 34 yards. reception on the team’s three-play, 77-yard touchdown drive…(12/2) vs. DEN: Caught three passes for a team-high 58 yards…Gave the Raiders a lead with his 13-yard touchdown reception in the second quarter…(12/9) @ GB: Caught one pass for eight yards…(12/16) vs. IND: Caught one pass for 12 yards…(12/23) @ JAX: Had three receptions for 27 yards…Capped off a 12-play, 70-yard drive with a 2-yard touchdown reception…(12/30) vs. SD: Had a game-high eight receptions for 84 yards…Caught three passes for 29 yards on a five-play, 37-yard drive to set up Janikowski’s 53-yard field goal at the end of the first half…Selected in second round (38th overall) of the 2007 NFL Draft. His 144 career receptions rank sixth in Arizona State history and are a school record for tight ends...His 1,512 yards rank second on the ASU all-time list for tight ends...His 14 touchdown catches surpassed the old school career record for tight ends (11)...Caught 56 passes in 2004, the 11th-best season total in school history and a school single-season record for tight ends, topping the old mark of 55...Those 56 grabs also set a school single-season record for freshmen...His 50 receptions in 2006 rank third on ASU’s single-season record chart for tight ends...Only tight end to catch 50 or more passes twice in a career...His 552 yards receiving in 2004 rank seventh on the school’s tight end single-season list...Caught at least one pass in 33 of his 35 games...Had at least five receptions in 14 of those games...One of only three players in the Pac-10 Conference to be named first team All-Pac-10 and first team Academic All-Pac-10 in 2006...Became Arizona State’s first consensus All-American since 2002 and the team’s 16th overall in 2006...Started all 35 games in which he played at ASU during the 2004-06 seasons…As a junior, made first team All-American...John Mackey Award Finalist...ESPN Academic All-American selection...First team All-Pac-10 Conference, Academic All-Pac-10 and ESPN Academic All-District VIII choice...Started 13 games at tight end...ASU’s Most Valuable Offensive Player of the Year and also earned the team’s Cecil Abono Team Captain and Pat Tillman Valor Awards...Led all Pac-10 tight ends with 50 catches for 484 yards (9.7) and scored four times...Caught at least one pass in every game and made four or more receptions in nine contests...Also recorded three tackles (two solo)...38 of his receptions produced first downs, as he converted 18 of 32 third down plays and two of four fourth downs...Six of his catches were good for 20 yards or longer...Caught four of seven passes thrown to him inside the red zone...In his sophomore season, he was named All-Pac-10 honorable mention and second team All-Academic Pac-10 (3.75 GPA)...Started 10 games and had 38 catches for 476 yards (12.5) and four touchdowns...Third on the team in receptions and fifth in receiving yards...Became second Sun Devil named the Pac-10 Freshman of the Year...Shattered ASU’s freshman receiving records and broke ASU’s single-season record for receptions by a tight end...His 56 catches tied him for the most in the nation by a tight end and ranked ninth in the ASU overall record book for receptions in a season. At Desert Vista High School in Phoenix, was unanimous selection as the No. 1 tight end prospect in the nation...USA Today first team All-American tight end and played in the U.S. Army All-American Bowl High School All-Star Game...Arizona Gatorade Player of the Year in 2003...Named the Phoenix Metro Magazine Player of the Year...Had 47 catches for 790 yards and six touchdowns as a senior...Also added 134 tackles on defense, 11 sacks and one interception...Won the Larry Gordon Award, presented annually to the state’s best linebacker and the Henry Stanton Award as the state’s top receiver...Amassed 27 receptions for 520 yards and six touchdowns as a junior...On defense, accumulated 102 tackles, 16 tackles for loss and 11 sacks...As a sophomore, made Student Sports Magazine Sophomore All-America tight end...Third team all-state by the Arizona Republic…Made All-Central Region second team at tight end as a freshman...Earned four letters in football and three in track and field...Set the school discus record and was the shot put regional champion in 2004...Finished third in the state in discus in 2003…Brother, Brent, also played for Arizona State and shared tight end duties with Zach in 2006.